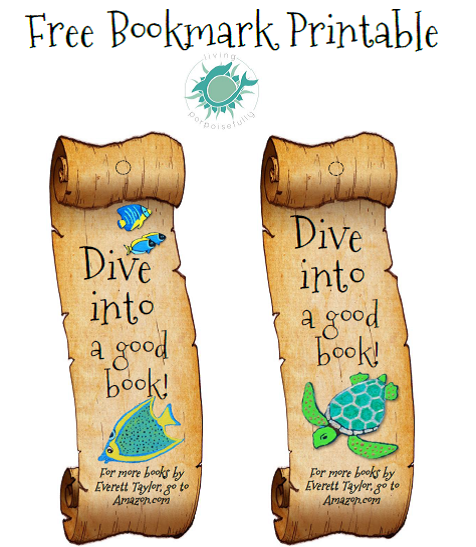 Make reading time special with an undersea bookmark. Print, cut, tie a ribbon, and you’re all set! It’s super easy and fun to make. Not only that, it pairs perfectly with the fun, spirited nature of our Zale’s Tales ocean adventure series. If you haven’t had a chance to see what all the fun is about, click here to bring the exciting tales right to your own home! You’ll be in for a magical dive into the sea that the whole family will bubble over. We gave our bookmark a special touch with brown craft paint, texture from Mod Podge, and an aqua ribbon, so scroll down for pictures! optional: brown craft paint, Mod Podge, a paintbrush, and a clean kitchen sponge. Print the Free Bookmark Printable on card stock, and use scissors to carefully cut around the edges. Use a hole punch to put a hole over the spot marked with a circle at the top of the bookmark. b. To make your bookmark a bit more durable and give it some fun texture, apply Mod Podge to a clean kitchen sponge with the paintbrush. c. Use the sponge to smush on the Mod Podge (don’t wipe, just dab the sponge up and down so the ink doesn’t smear). d. Let it dry, and then paint Mod Podge onto the back of the bookmark with a paintbrush. When you’re done, rinse off the kitchen sponge and paintbrush with soap and water. 4. Last, but not least, dive into a good book! Enjoy the adventure, and stay tuned for the next pieces of the Ultimate Undersea Treasure Basket. Live porpoisefully! Can you make a coloring page version?